Researchers at University of Tampa conducted a 12-week study that showed subjects receiving the BetaTOR compound found in Clear Muscle also known free acid HMB, gained 16.3 lbs. of muscle in 12 weeks. The placebo group gained 4.6 lbs. These results are more profound than any results from research conducted on protein, creatine, BCAAs, or any other performance-enhancing compound. Clear Muscle is a muscle builder delivers anabolic power in two tiny pills. In fact, you would have to consume 200 grams of whey protein in order to yield the 1-gram dose of BetaTOR found in a serving of Clear Muscle. What’s more, BetaTOR also helps fight catabolism after every dose for superior muscle building effects. The Clear Muscle formula is the first to contain BetaTOR, and is only available from MuscleTech in a clear liquid pill. The free acid nature of the compound gives it a viscous, water-like consistency and transparency. In fact, the free acid nature of BetaTOR allows it to digest and appear in the bloodstream quickly, and also delivers a superior muscle absorption rate. PHASE8TM is a premium blended protein formula that feeds your muscles for 8 hours. Each scoop contains an impressive 26-gram blend of milk-derived proteins that supplies a sustained-release of amino acids. PHASE8TM has a superior, clean macronutrient profile with only half the carbs and fat of the leading competitor. 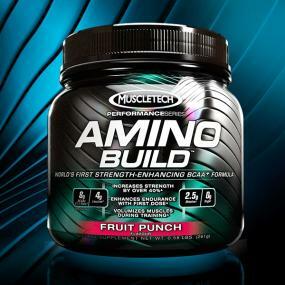 Muscletech Amino Build, Fruit Punch, 30 serving, Branched Chain Amino Acid (BCAA) Supplement with Betaine 0.58 LBS. Amino Build is a superior pre-, intra-, and post-workout complex delivering a massive 8g of a 100% free-form 2:1:1 BCAA Matrix (per 2 scoops) to help fuel skeletal muscles, preserve muscle glycogen stores, and reduce protein breakdown. Amino Build is precisely formulated with a 4g dose of L-leucine, which was shown in a clinical study to help subjects increase their 5-rep max strength by over 40% in just 12 weeks. Amino Build comes packed with a clinically studied 2.5g dose of betaine, which helped study subjects significantly enhance their muscular endurance. A 1g dose of taurine was also added to the formula, and has been clinically shown to improve performance in endurance athletes when consumed 2 hours prior to cardio. Reference – 1. Ispoglou et al. 2011. International Journal of Sports Physiology and Performance. 6(1), 38-50.2. Hoffman et al. 2009. Journal of the International Society of Sports Nutrition. 6:7.3. Balshaw et al. 2012. Amino Acids. In addition to its key ingredients, the Amino Build formula delivers 4g of a Cell-Volumizing Muscle Complex that comprises taurine, L-glutamine, L-citrulline malate, and L-alanine. Together, these compounds work to enhance cell volumization during training. Amino Build was flavored by experts in one of the world’s top flavoring houses in order to taste better than any other amino acid powder on the market.